Syria Daily: Reconstruction? Not in East Aleppo…. 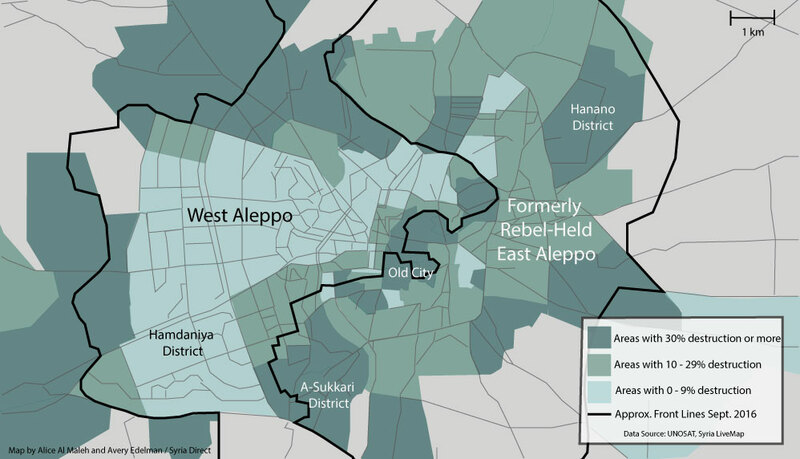 Two years after its recapture by pro-Assad forces, much of eastern Aleppo city remains in devastation, with its residents forced to sell their properties. After years of bombardment and siege and five months of a crippling Russian-regime blockade and intense bombing, the opposition part of Syria’s largest city fell in December 2016. Many of its civilians as well as rebel fighter and their families were forcibly displaced to other opposition territory in the northwest. Pro-Assad propaganda declared “liberation” and “reconciliation”, with plans announced within a month for restoration basic services to “allow the people of Aleppo to live a normal life”. 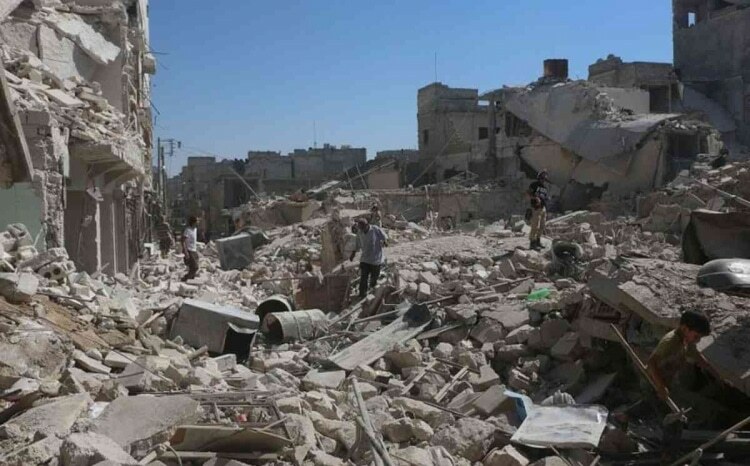 But districts such as al-Sukkari are still destroyed. Residents say they cannot afford to rebuild, so are forced to sell their homes. Retired university professor Muhammad — his full name is withheld for the safety of his relatives — is still displaced in western Aleppo Province, with his wife remaining in the city to oversee the sale of the house. Very little has changed since the last days of the resistance, locals say. “There is no reconstruction, except for what the residents do themselves on an individual basis,” says Abu Haitham, who owns a real estate office in the Old City. Still hampered by manpower shortages from defections and casualties since 2012, the Assad regime relies upon militias and proxy forces to oversee the area. Damascus has announced efforts to curb the militias, some of whom are commanded by Iran, but residents they are still vulnerable to harassment, theft, and worse. Um Fouad sold her house earlier this year and left for Turkey. She was from regime-held Hamdaniya in western Aleppo and spared destruction, but an army officer squatted in her son’s apartment just above the one in which she lived. She is now “hopeless for return”. There’s neither work nor safety. Most of the houses that have been left by their owners are effectively occupied. It doesn’t matter if the owner is loyal [to the regime] or opposition — just as long as the house is empty. There are some PR-led exceptions. The UN Development Fund has conducted scattered “rehabilitation” projects around the Old City. Syria’s Ministry of Tourism released a video this month showing drone footage of trucks clearing rubble and men in helmets and high-visibility jackets working on reconstruction of historic sites. But Alhakam Shaar of the Budapest-based Aleppo Project, which documents reconstruction and development, says “there has been some movement to rebuild that we cannot ignore” but “outside the Old City it has been very limited” with most houses still “heavily destroyed”. The Assad regime has informed the family of an Syrian-American dual national, arrested in 2016, that she died in detention almost two years ago. Layla Shweikani traveled to Damascus in 2015 to help displaced Syrians. She was detained by regime forces in February 2016 because she has assisted refugees in the opposition area of East Ghouta near the Syrian capital. They have reported that she was charged with “supporting terrorism”. The Syrian Human Rights Committee said news of Shweikani was “suddenly cut off” on December 26, 2016 when she was in Adra Prison, notorious for torture and execution of detainees. The regime’s notification to Shweikani’s family dated her death on December 28, 2016. The Syrian Revolution Network reported that Shweikani was tortured to death in the prison. Tens of thousands of detainees have died in prison from poor conditions, torture, and execution. The Syrian Network for Human Rights estimates that more than 95,000 people are still forcibly “disappeared”.